Looking past not just the work of historians. The travelers also can take part and enjoy it through the rest of the remaining historical sites. Usually, this recreational event better if the information conveyed was accurate. However, troublesome in this country is not all that historical legacies are in prime condition. It is untreated, also forgotten its existence. If you do not believe the phenomenon, let's for a while "looking for the wind" to the number Road Prince Jayakarta, Jakarta. In this area there are at least some historical sites that we can compare the value of history and current condition. To begin with, we can take the start of the Zion Church. A relic of the Portuguese church that used to be called Portugeesche Buitenkerk. That is, the Portuguese church outside (wall) City. Because, until the early 19th century, there are still other Portuguese churches in the city. ime telling us more about some other sites that can also be found in the White Rose Prince. From the Church of Zion, a little farther down the road we saw Prince Jayakarta Toyota car showroom. In this place a few years ago there is a monument that a bit strange. A whitewashed wall and on it placed a skull made of plaster. On this memorial wall text written in Dutch and Javanese. This monument is deliberately created for a memento of the event of the death penalty against Peter Erberveld. According to Adolf Heukeun, observers Batavia history, Erberveld was a fairly educated. He was descendant of a wealthy German who married a Thai woman. His parents, Peter Erberveld comes from the town of Elberfeld, which is now part of Wuppertal in the state of Nordrhein-Westphalen, Germany. Peter Erberveld lot to do with local communities around Batavia. That said, he was already associated with the sons and daughters Suropati, who continue to fight Vereenigde Oost-Indische Compagnie (VOC) in East Java. He said he likes to share a small copper plate to admirers admirers as a talisman. Time history that still remains can still be seen if you browse the White Rose Prince Street more inward. 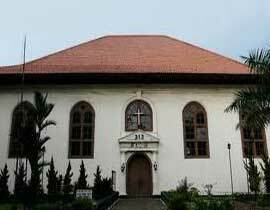 Not far from Zion Church at Jalan Gunung Sahari, after passing the railway flyover, we'll find a narrow alley. On the front terpampang an information board. This is a sign that could lead to the tomb Raden Kartadria, Peter Erberveld friend who joined the Company executed. Rather than Erberveld monument, the tomb is arguably more fortunate fate. Because sacred, conditions always preserved. Flowers fragrant scent permeates the entire building which covers protectors seven times seven meters. Ceramic floors are clean. Although located in a narrow alley, typical dense housing in the capital, the tomb of Raden Kartadria always visited by the pilgrims. Exit the tomb Kartadria alley, about five hundred yards we will find Gang Youth. This narrow alley located on the left towards Jalan Gunung Sahari. In the past, "street rat" is called Gang Souw Beng Kong. Because in it there is the tomb of Souw Beng Kong, China's first lieutenant in Batavia. According to David Kwa, observers of Chinese history, the tomb is "forgotten" once only during the New Order period and only be visited again after the reform took place a few years. Reportedly, exist plans refurbishment by Committee Restoration Sites Souw Beng Kong. In addition to renovated, the tomb also be developed into Park City and The Object of History and Culture Tourism. This idea received a positive response from many quarters. In the 1930's Souw family cemetery is still surrounded by coconut trees are lush. The tomb was never restored by the Kong Koan (Chinese Officer Council) for the first time in 1909 and the second time in 1929 who was then under the leadership of Kim An Majoorder Chineezen Khouw (1875-1946). Inscriptions in both Chinese and Dutch in both left and right sides of the bong-pie original, written by Kim An Majoor Khouw dated October 11, 1929, gave a brief history Souw Beng Kong and asserted that the bong-pie was renovated in the year above the cost of Kong Koan. Souw Beng Kong (or Bencon, the Dutch text) is one important figure in the early development of the city of Batavia. He was born about 1580 in Banlek period (1573-1620) of the emperor in the district Tjong Sin Beng Tang-oa "(Tong'an), residency-ciu Coan (Quanzhou), province of Hokkien (Fujian), South China.